Have you ever opened an iMessage conversation on iPhone to discover that the messages are out of order? If so, you’re not alone. While it can be annoying to have the Messages appear out of order in the Messages app of iOS, it’s usually a simple fix to get them to be in proper sequential order again. And yes, this applies to the Messages app on iPad as well, so while our focus is primarily on iPhone the techniques to resolve messages appearing in the wrong order is the same on other iOS devices too. First we’ll cover enabling a Messages in iCloud feature that should resolve messages appearing in the wrong order on iOS devices, and then we’ll address troubleshooting steps to fix Messages showing up out of order on iPhone and iPad too. Using Messages in iCloud should completely resolve any iMessages appearing out of order issues if they are lingering or persisting, though it can take a little while for messages to sync with iCloud and then to correctly display. It can be helpful after enabling Messages in iCloud to then restart the iPhone or iPad, which seems to force Messages to reload and then appear in the proper order as intended. If you are still experiencing Messages showing up out of order, follow the troubleshooting steps below to help fix the problem. 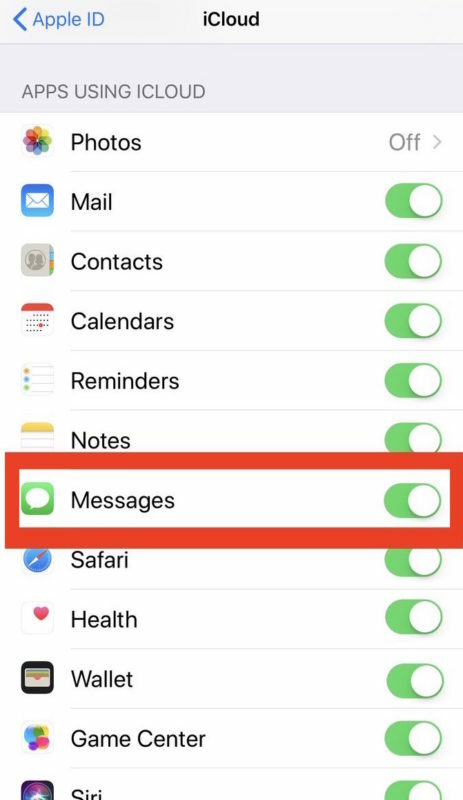 Here are the primary troubleshooting steps to resolve iMessages appearing out of order on any iPhone or iPad running iOS. For best results, you should enable Messages in iCloud as described above first. Once the Messages app has been forcibly quit, and the iPhone or iPad rebooted, open the Messages app again. The Messages should be back in order as intended. Return to the Messages app and check if your iMessages are back in order as intended again. Do note that if an iPhone or iPad has no internet connection, the automatic time setting may not work precisely, and if the iOS device has never been connected to an internet connection then you may want to use the manual time setting adjustment. Some users have reported various issues with Messages appearing out of order after installing a particular software update, or while running an older software version. Back up your iPhone or iPad first, and then install any available software updates. There are some versions of iOS that appear to be more prone to message syncing errors than others, so if at all possible try to run the latest version you can. Regardless, after you update iOS, go ahead and relaunch Messages app. If they’re back in order as intended, you’re good to go. Another trick that can work is to turn iMessages off and back on again. Another alternative option is to turn imessage off, then reboot the iOS device, then turn iMessages back on again. That can work sometimes too. Did the above tricks work to fix your iMessages from appearing out of order? Are your imessages now back in order on the iPhone or iPad? Let us know what worked for you in the comments! Force reboot the phone? Seriously? Will this myth never die? Of course not, that would be like expecting journalism to make a comeback. Reboot the phone the normal way, there is only one reason to use the non-maskable interrupt to reboot the phone and that is if the UI or input devices are unresponsive. A force reboot like you suggest is exactly the same as pulling the power cable out of the back of your PC while you’re using it. We’d not give that advice with a straight face, so why is it given or iPhone? It is just that “Force Restart The Phone” sounds better to you than “Turn it off, and then back on”. Don’t even get me started on the banal concept of terminating the background processes of a NON RUNNING app, and then terminating the entire phone. Sheesh. Pathetic. Thanks for your thoughts and feedback Mat. Do you have a solution to iMessages being out of order, or are you just here to criticize the methods offered? This happened to me and the problem was fixed when T-Mobile updated their carrier settings. Took about 3 weeks for them to figure out what happened. You sound lonely. Are you OK? Why do you have a phone if nobody is calling? If never connected to internet for time set, how would any messages be received? Only IOS update worked for me, at some point it was very annoying, now it.’s fixed thanks to the update! I’m a very longtime Mac user since 1984. I’ve owned all of them, well, except those crappy Centris. So I’m smart about Macs. And I read this page every damn day. Reading is how I GOT smart. Some of the hints are pretty basic, some not, but all reliable. I’ve seen this problem manifest on both the iPhone and iMessages on the Mac. Because this began happening with the recent updates of iOS and the messages pass through Apple’s systems first, I am blaming this on Apple’s oversight of a bug — that they should probably consider fixing. as always all recommended solutions do. not. fix. the. problem.